Hola! 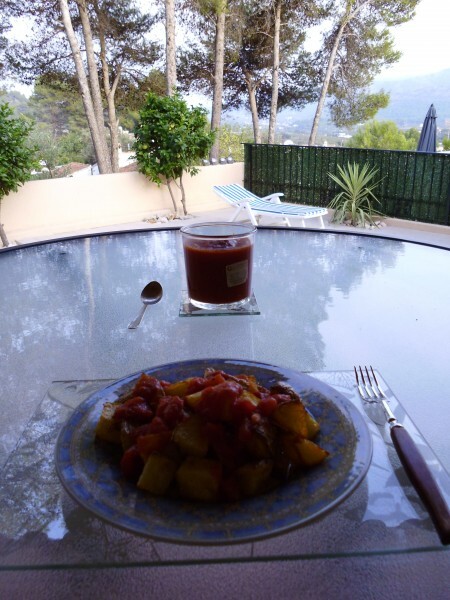 I decided to recreate the patatas bravas that I had for tapas in the Spanish restaurants! When making the patatas, I accidentally picked up the vinegar instead of the olive oil to cook them in! This worked out well as the patatas turned out very crispy and delicious cooked in a mixture of vinegar and olive oil! Chop the potatoes into pyramids. Now place them on a baking tray and drizzle with vinegar and olive oil. Put the tray in the oven and bake for 45 minutes or until browned and crispy. To make the bravas sauce, heat olive oil in a sauce pan over a low heat. Add the chopped garlic and fry for a minute or two. Then add the can of tomatoes, tomato puree, cayenne pepper, paprika, sea salt and black pepper. Simmer on a low heat while the potatoes cook. 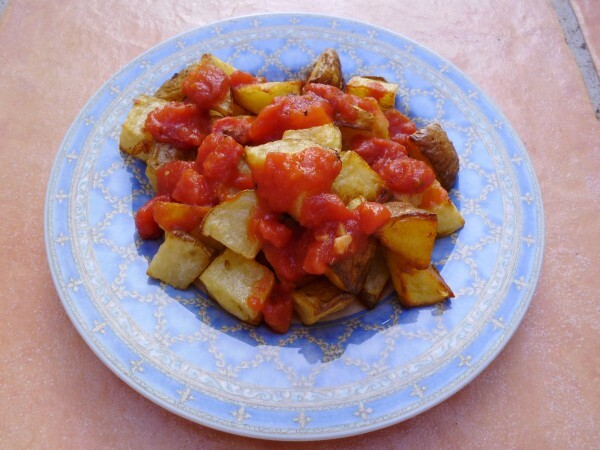 Pile the patatas onto a plate and spoon some of the spicy bravas sauce over the patatas. Serve warm. Store the excess bravas sauce in a container in the fridge. Very tasty on chips!